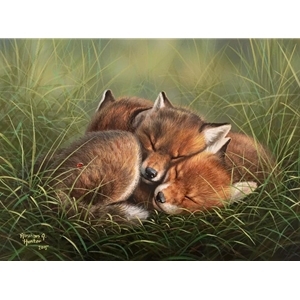 These baby foxes have been playing all day, and finally exhausted, are ready for a nap. For Mama it couldn't have come too soon. She is probably all tuckered out too from trying to keep up with them the whole day... but she still has to go out and find food for the family. A mama's work is never done, as they say. I'm sure that she will find a little time to herself now that the little ones are both having Sweet Dreams.